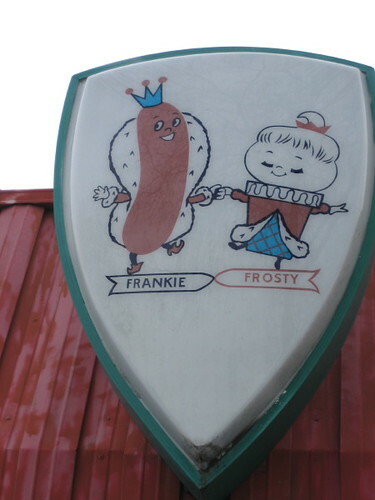 Awhile back, I talked about the interesting things one might see by looking down while walking. Here in Berkeley it has definitely proved to be interesting. I am very intrigued by the all of the old railroad tracks that still exist, particularly in West Berkeley. It has also been fun to see where old sidewalks have been replaced by the slightly spongy material that prevents trees from cracking through. I’ve kept an eye out for interesting engravings in the sidewalks as well. But I still have work to do with learning to pay attention to everything around me. This portion of sidewalk is located in front of a violin shop on University Avenue, a street I walk along often as it is an east-west connector. I am intrigued by the violin shop because there are no storefront windows (it is more like a regular house), and I often watch to see if people are coming in or out with violin in hand. The shop also has a nice violin cut-out in its wood entrance. 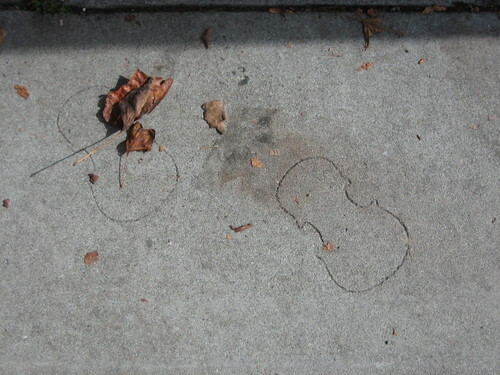 But because I was always looking up at the store, I never noticed the violin engravings in the sidewalk! Inevitably on busy streets, cyclists will sometimes ride on the sidewalks. Although I have encountered bicycles on the sidewalks while I am walking they have not caused any problems for me as a walker. Likely this is because I am generally comfortable riding and being around bicycles. I know that sometimes this causes problems, though; even on designated shared bicycle and pedestrian paths I have seen startled walkers when bicycles come by. Once in awhile I am a little bit surprised when someone is riding on the sidewalk when there is a nice wide bicycle lane on the street, but otherwise I haven’t spent too much time being bothered even if a cyclist shouldn’t really be riding there. One thing I have found in general as I have walked more and more is that I am less likely to be upset or angry about any incidents. Cars speeding through intersections as I try to cross used to bother me sometimes, but now I just wait and let them go and move on. But getting back to the bicycles, I was surprised to see some discussions recently about how many more bicycles ride on sidewalks now that many cities have incorporated wheelchair accessibility into the sidewalks in compliance with the Americans with Disabilities Act. 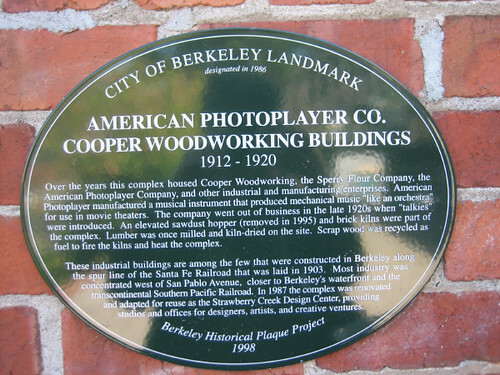 (Berkeley, in fact, was a pioneer for curb cuts, as well as for other rights and services for the disabled.) I had never thought about this before, and I am not sure whether any scientific studies have been done on the topic, but it makes sense that this would be the case. Certainly plenty of cyclists are comfortable riding up and down regular curbs, but it is much easier to do so without effort when there are curb cuts. Until thinking about this possibility, it had never occurred to be that there was anything negative that could be associated with curb cuts other than the usual city government arguments that surround priorities in funds used for public infrastructure. But I should have realized that there is always more than one side to everything. I don’t want to make it a priority to try come up with possible negative aspects of things that I see when I am walking, but this was a small wake-up call that there is much more to think about even when I believe I have come to a conclusion about an idea. I don’t really keep up with shopping trends or media hype surrounding holiday shopping, but while I was doing some unrelated research I found that flat-screen TVs are supposedly one of the “hottest” gift items this holidays season. It made me remember that I had wanted to point out the “TV house” in south Berkeley, which I have passed a couple of times on my walks. I wonder how many knocks on the door the residents of the house have received. Somehow it reminds me of being in a museum looking at modern art; there will be the people who stand quietly and contemplate the piece of art, others who confidently announce what they are certain the piece means to their companions or other museum-goers, and even others who just have to know the answer and will inquire about the piece of art. Strangely, despite my strong feelings about television, consumerism, and waste, I don’t actually need to know what the meaning is behind this display or the intentions of the person who placed the TVs there; I just enjoy running across something interesting and out-of-the-ordinary once in awhile. If the holiday shopping predictions are correct, perhaps there will be many more TVs sitting by the side of the road waiting to be added to this display. I will be walking but likely not posting over the Thanksgiving weekend, so expect a new post early next week. I will definitely walk in Berkeley, but I may also go for a walk in downtown San Francisco as Joe and I have done in the past on the day after Thanksgiving. It is a great chance to see the interaction between everyone who has come out for the “biggest shopping day” — the shoppers, the fur protesters at the department stores, the Buy Nothing Day groups (which in the past have included people dressing up as sheep and running through the stores and shouting “bahhhhhh nothing”), the Critical Mass cyclists, and whoever else decides to show up that day. 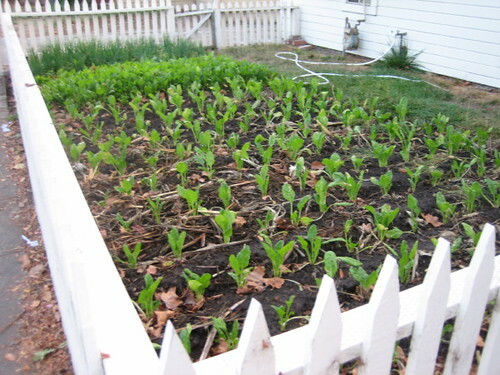 One of the Walking Berkeley posts that has generated the most interest and e-mail messages was my post awhile ago about Front-Yard and Parking Strip Gardens. I was surprised that so many people were interested in the topic, but even more intrigued to find that I regularly get visitors to my blog from people searching for terms such as “front yard vegetable gardens” and “growing vegetables in the front yard.” In the time since this previous post, I have also spotted more front-yard vegetable gardens in Berkeley. Perhaps more people are interested in converting their lawns to food than I previously thought. Back when the E. coli spinach outbreak occurred, spinach was still available at the farmer’s markets here. 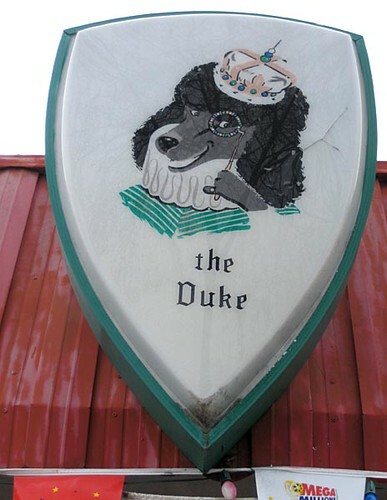 Many of the farmers had posted large signs next to their spinach explaining that their spinach was grown on a small farm completely unconnected and much different than the industrial spinach that was identified with the outbreak. I wondered at the time if some people also made the decision to finally start growing some of their own vegetables. Interestingly, I spotted this front-yard garden not far from the location of the South Berkeley Farmer’s Market. The greens were young enough where I could not tell for sure what they were, but likely either spinach or chard. In the background are the beginnings of either leeks or onions. This garden is different than most I have seen in the front of houses; usually there are raised beds or some sort of container, but in this yard they have used most of the available space for food. The garden is located on a very busy street, but the fence protects it somewhat from trampling or picking.